The Google Clips camera is an artificially intelligent camera that automatically shoots photos of your life from wherever it's placed. Although dubbed "creepy" and "invasive" by some, Google’s camera isn’t so different from other competitive products that have come before it. Action and lifelogger cameras, such as the GoPro Hero and Narrative Clip 2, respectively, and portable and typically capture imagery while worn on the body. Smart home security cameras (Clips shares a striking resemblance to the Blink security camera) save local/cloud recordings and allow real-time monitoring. Modern mobile devices, apps and digital cameras have intelligent face/eye detection features for improved photography. So how does one use a camera like Clips? It’s helpful to first understand — and put to rest any fears — what the device can and can’t do. The Google Clips camera is meant to be a hands-free accessory that takes candid photos without any intervention. It can sort of replace the need for selfie sticks and/or a dedicated photographer (to an extent). One of the Clips camera’s biggest strengths is its simplicity, which also means a number of situational limitations. Google Clips is not a point-and-shoot camera: You can turn the Clips camera on/off as well as initiate recording through the manual button on the front. But that’s it. There is no LCD screen, no viewfinder, nor settings/controls to adjust. Everything — particularly captured content — is performed automatically by the internal hardware and software. Google Clips is not a security/spy camera or nannycam: The Clips camera records "motion photos" (without audio, due to lack of microphone) at 15 frames-per-second (FPS) for only several seconds at a time. Home security cameras continuously record video with audio at 30 FPS. Google Clips has a white exterior, visible LED that glows while recording, and only lasts up to three hours per charge, which makes it a poor substitute for a security/spy/nanny camera. 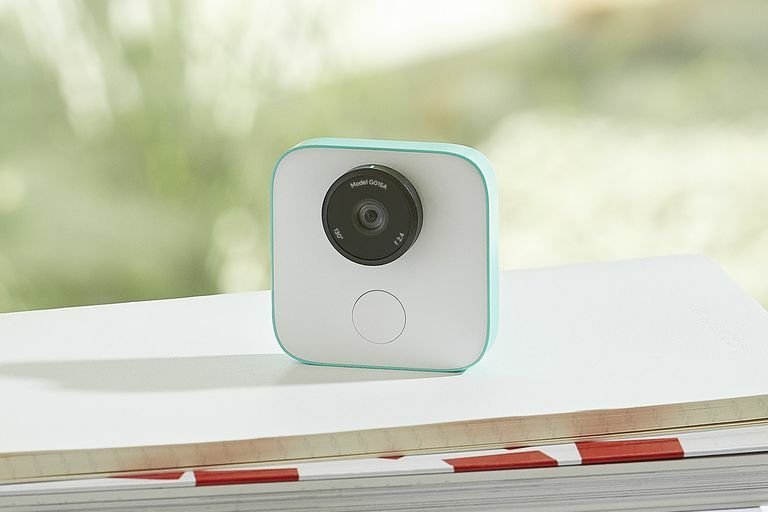 Google Clips is not cloud-/network-connected: The Clips camera features Wi-Fi Direct and Bluetooth LE, which allows direct pairing to smartphones in order to view/share videos (via the Clips app for Android/iOS). Unlike surveillance cameras that require a network connection for recording, replays, and/or real-time monitoring, Clips is completely self-contained, private, and secure. All data stays on the unit until sent to a mobile device (the transfer is also encrypted). Google Clips is not (really) an action/lifelogging camera: Although the Clips camera can be worn (via the included clip stand), it performs best when placed in a fixed location — stable shots tend to have better focus for more photos worth saving. The clip stand allows for spontaneous and unique perspectives (e.g. attached to the backs of chairs, ends of tables, strollers, etc.) without having to engineer a solution. Google Clips is not for trips or vacations (yet): The Clips camera features Google’s Moment IQ machine learning algorithm, which is designed to recognize (e.g. lighting, framing, facial expressions, etc.) and capture great photos. The algorithm focuses on people and pets (common ones, like dogs and cats), especially those seen more often. As of yet, Google Clips is inadequate for taking pictures of landscapes, buildings, random objects, or strangers. Google Clips won’t work with all phones: Clips is compatible only with select Android (running Android 7.0 Nougat and higher) and iOS (running iOS 10 or higher) smartphones. Using Google Clips is simple. Simply twist the lens to turn the camera on, set/mount it somewhere facing people/pets, and then let it do its thing. The 12 megapixel (MP) lens has a 130-degree field of view (FOV), so there’s little need for precise aiming. If you want to manually trigger a recording, press the shutter button below the lens. Google Clips has 16 GB of internal storage for saved video and recharges through the included USB-C cable. When you want to view, delete, edit, or share videos/photos (video frames can be exported as auto-enhanced still photos) from the Clips camera, just connect using the app (Android/iOS). Content can be downloaded to the smartphone and/or uploaded to Google Photos for safekeeping. Given the specialized hardware — Intel’s Modivius Myriad 2 vision processing unit (VPU) — along with Google’s Moment IQ machine learning algorithm, one should expect Clips to record more quality content than not. The Google Clips camera is not meant to replace smartphone or digital DSLR/mirrorless camera photography. Instead, it’s more of an accessory to help people capture candid moments they wouldn’t have been able to otherwise. Given its pocket-portable size, it’s easy to carry and place Google Clips most anywhere. For example, imagine that you want photos of the family having fun together on game night. As the photographer with a smartphone or digital camera, you’re likely to be excluded unless you set a timer or use a remote shutter — you may also need a tripod. The former option disrupts ongoing play while also negating the whole "candid" element. The latter hinges on remembering to press the remote as well as pure luck of capturing worthwhile images. Face detection/tracking: Snapchat and all the alternatives with face-tracking filters use face detection technology in real-time to apply fun animations to your selfies. Samsung Galaxy smartphones feature Smart Stay technology – the front-facing camera senses when you’re looking at the device, thereby keeping the screen on despite timeout settings. And if you upload photos to social media, Facebook’s facial recognition feature will pre-tag familiar friends for you. Eye/smile detection/tracking: Advanced digital cameras commonly feature eye/smile detection/tracking. When enabled, it helps the camera lock on and follow subjects (particularly helpful when they’re in motion). This feature is usually tied to the shutter release, which means the camera takes the picture the instant it senses open eyes, big smiles, and great expressions (as opposed to faces in mid-blink with pursed lips). Picture worthiness: Photo editing apps can identify/highlight objects, sharpen/blur, adjust brightness, contrast, saturation, and more. Many feature some form of one-touch auto-enhance that corrects everything at once. So it would be no stretch of the imagination to program a camera with thresholds, allowing it to take photos when subjects/faces are in focus (i.e. auto-focus) and areas are well-lit, among other various contextual/artistic criteria that make for interesting pictures. Where Google Clips pushes the boundary of leveraging artificial intelligence is through its ability to recognize faces without needing internet access for instruction or assistance. Everything is processed on the device itself, completely offline (i.e. secure for those concerned about privacy). As the Clips camera sees more of the same faces, it learns to recognize those as ones that should be recorded more often.